Scissor lifts are aerial lifting machines that typically only move vertically. often used in a variety of industries. They are primarily used as aerial platforms that lift people to reach tall heights in the following industries: Agriculture, Painting, Roofing, Construction, Electrical, and Tree Removal. Scissor lifts provide several benefits over ladders include safety of the worker and a level space in which to work. Powered by hydraulics, scissor lifts unfold the lift supports to move the platform to the necessary heights. These lifts come in different shapes, sizes, lift heights, and power options from the small-scale pallet lift to the large, high-level lifts that can extend up to 90’. 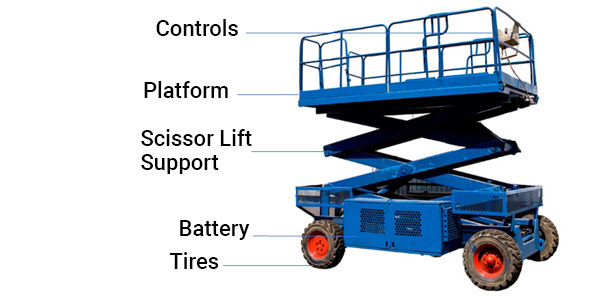 A scissor lift is operated by two different control panels. The first is at ground level on the machine, typically at the back of the counterweight. The second is located on the platform. The ground controls propel the machine, engage the platform, and has a kill switch for safety purposes. The engine is operated from the platform by a boot-like enclosure that has a foot-controlled lever inside it. The platform controls lift the platform, move it around. Some scissor lifts may come with safety features such as a fire extinguisher and harnesses to secure the operator in case of a fall. It is important to assess the type of material you will be lifting on the scissor lift. Scissor lifts are best utilized with stable materials that can fit on the platform and is not off-center. You should never lift any material that doesn’t fit on the platform of a scissor lift. There are three types of transition methods for moving loads off the scissor lift: Rolled on/off, Slid on/off, and placed on/off. Knowing how you plan to move the materials is critical in choosing an appropriate lift. The weight of the load is important to consider because the platform may require additional supports to prevent deflecting or bending. Some scissor lifts can lift up to 6,000 lbs while others only 600, including the weight of the operator. Most scissor lifts have a working height range for 20 to 40 feet, but smaller may extend only 10 feet while others, as mentioned before, can extend up to 90 feet. It is important to assess the overhead room and the needed reach before picking a scissor lift. 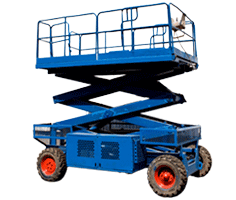 There are several popular manufacturers in the Scissor lift market including Haulotte, Genie, JLG, and Skyjack. Looking to compare scissor lift models side-by-side, from either the same manufacturer or competing manufacturers? RitchieSpecs allows you to compare the dimensions, specifications, and operational aspects of over 175 scissor lift models. Once you’ve found the scissor lift model that fits your needs, browse scissor lifts for sale on IronPlanet and Ritchie Bros Auctioneers.